There are many variables that affect diamond blade performance and cost. 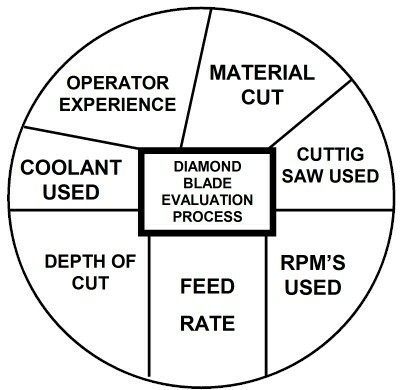 It’s in the end users best interest to understand these variables and setup some standard for their diamond blade cutting operation and test evaluations. Following proper diamond blade testing procedures and testing methodology will help end user answer numerous questions concerning diamond blade life, rate of cut, straightness of cut, and quality of surface finish related to material being cut. Allowing the end user to understand, evaluate and compare cutting costs. As well as evaluate performance of diamond blade with a different specification being used and compare against a diamond blade supplied by a different manufacturer. Proper testing procedures and methodologies must be set up and used to obtain accurate as well as repeatable testing results. This article will discuss several simple procedures which have been used under actual field conditions, verifying their feasibility for testing diamond cut off wheels. All diamond blade manufacturers do a certain amount of testing of their own products. In order to improve existing products, develop new products, compare against competition and etc. Each blade manufacturer typically uses their own methodology and hence different manufacturers may produce various results. In this article we will attempt to provide some standardization in constructing testing procedures. In general, the procedures set up and results obtained within the manufacturers facilities will tend toward ideal conditions and results. These results cannot necessarily be duplicated in the customers facility. Their operating conditions undoubtedly will vary considerably from those within the manufacturers plant. However, it must be realized that the final test of a product is under the customers conditions and within their facilities. This is known as “field performance”. Generally most diamond blade manufacturers are in best position to engineer diamond blade tests. Equipped with proper equipment which is in reasonably good condition, operators who are familiar with the correct use of diamond blades, the adequate use and proper application of coolant, controlled speeds and feeds, adequate mounting of material to be cut, as well as other recommended conditions for the use of diamond cut off wheels. Under these controlled conditions the results obtained within the manufacturers facilities naturally tend toward the ideal. 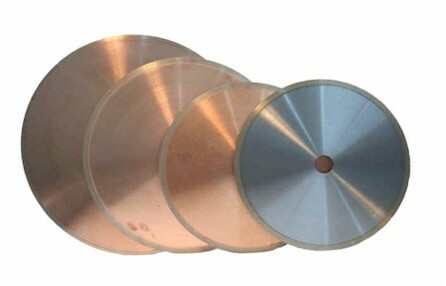 It is the experience of the diamond blade manufacturer that it is practically impossible to obtain two identical cutting wheels no matter how carefully the duplicate is made. 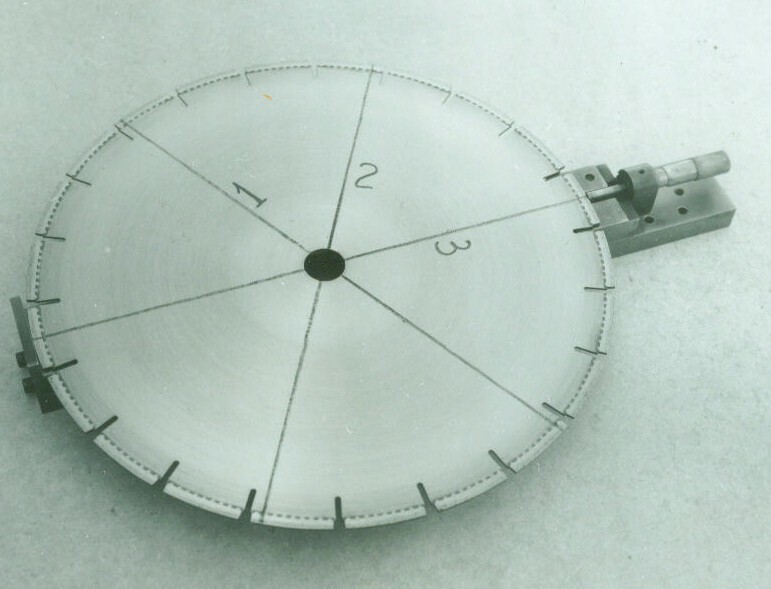 Under strictly controlled laboratory test conditions, supposedly identical cutting wheels can give cutting efficiencies which vary by ten percent. Not only between the blades themselves, but between various consecutive tests with the same diamond blade. Nevertheless, controlled test conditions can point out consistent differences in a product and invaluable to both manufacturer and end user. For the user they point up what results in the way of greater production and lower costs he could expect if their operating conditions were improved. For the manufacturer, this presents an opportunity to make new developments to improve their products, to produce a more consistent product and to compare their products with their competition with similar specifications or intended uses. There is no universally perfect test procedures. However, any test procedure must be able to duplicate results and to simulate the field application and to make it possible to correlate these results with what may be expected in actual applications. The testing procedure does not have to be elaborate, but should be capable of providing complete information in order to properly evaluate test results in light of customer requirements. What is the blade life? the rate of cut? the quality of finish? the types of materials cut. Why did the blade perform as it did? Answers to such questions are needed in order provide a point of departure for any future changes. A test program must consider the amount of time and money available as well as the exactness of results required to meet customer objectives. 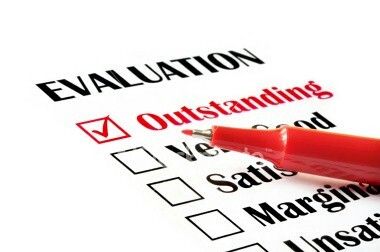 Customers requirements must always be kept in mind when conducting tests. Generalizations and estimates can be made, however the results may not fit the field conditions. One client may wish a fast cutting blade without too much regard to wheel life, surface finish or chipping of material. Another customer may be more interested in slower cutting blade with a longer blade life and fair finish. In predicting diamond wheel performance it is important to take into account the rate of wear of the diamond blade in relation to amount of material cut, cutting time required and the power consumption. These factors are essential so that all of the cost factors, including not only blade cost, but labor and overhead costs as well, can be compared for different types of diamond cut off wheels. in setting up test process for use “in plant” which can also be used “in field” for the determination of diamond cut wheel wear or wheel life and cutting rate of the listed variables. Item 2 and 3 will not be considered since, normally this information is known only to the manufacturer. Also, in general since “in field” tests are concerned mainly with testing one blade against another under similar conditions for a specific application, all the variables except 2 and 3 should be analyzed and considered. The material being cut and its variations plays a major role in determining life of a diamond blade. Unfortunately there is no universal diamond cut off blade which will cut thousands of different types of non metallic, hard and brittle materials efficiently and economically. It is therefore necessary to have different specifications for different materials or groups of materials. When conducting the tests it is most essential to use the same materials and to have the materials as consistent as possible in structure and hardness. If a variety of materials are being cut, a logical weighting system must be used in taking into account the structure, hardness, grain size, etc. and to resolve the variations to a common denominator. The feed rate or the speed at which the diamond blade moves through the material being cut, has a very pronounced affect on the cutting results. It is closely related the depth of cut, the structure and the hardness of the material being cut and the blade specification. Never force the diamond blade beyond its cutting ability. This will only result in a glazed diamond blade, poor cutting and shortened blade life. For any accurate comparison of results, the feed rate must be the same for all tests which are designated for the same purpose. in this cutting application can be seen the affect of varying the cutting feed rate on diamond blade cutting efficiency. When the blade was not crowded by kept within the recommended operating conditions, about 45% greater blade life was obtained. In other words, we have reduced our blade cutting cost about 33%. Peripheral speed of the blade – SFPM – is directly proportional to the RPM and has a very pronounce effect on the cutting results. It must be closely check and kept the same for each comparative test. The correct blade speed will result in a blade operating at maximum efficiency with lower cutting cost at a maximum cutting rate. For general recommendations of diamond blade speed ranges for cutting few of the non-metallic, hard and brittle materials, see recommended chart. in this cutting application can be seen the affect of varying the peripheral speed of the diamond blade on cutting efficiency. When the speed was kept within the recommended operation conditions, about 38% greater blade life was obtained. In other words, we have reduced our blade cutting costs about 28%. It is common knowledge that no two machines will give identical results. Therefore, for comparative results test should be made on one particular machine. It is important that the machine be kept in good working condition at all times during testing process. A machine in poor condition will result in worthless test data. Poor bearings, poor shaft conditions, loose rolling table or blade carriage, loose belts, dirty flanges et centers, will cause poor finish, short blade life and other undesirable results. To reduce the affect of unnecessary wear and poor cutting results, the machine should be checked and serviced daily and completely overhauled every two months or more if necessary. In almost all diamond blade cutting applications some for of coolant must be used. Cases when coolant cannot be used regardless of reason are special and will not be considered in this article. 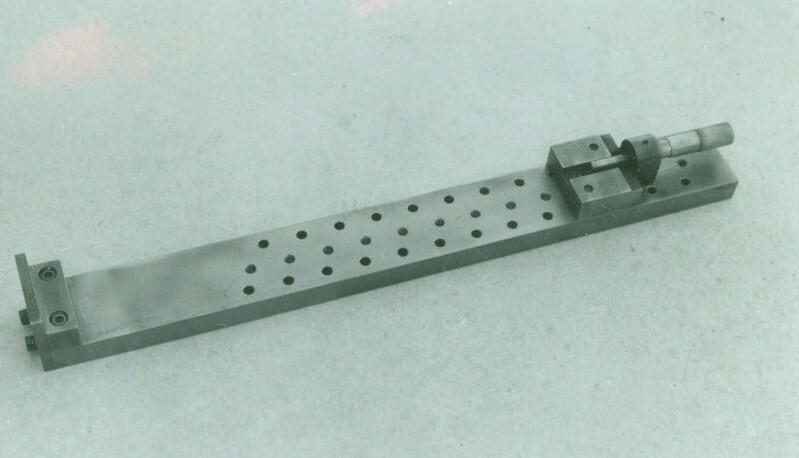 Main purpose of coolant is to keep the diamond blade cool so it will not wrap and cool the localized points of heating resulting from each diamond particle machining or grinding the material being cut. A coolant is also used to clean away the swarf and to lubricant both the diamond particles and material work piece. Improper use or application of coolant will result in greatly shortened blade life, poor cut surfaces and damaged pieces. The mere presence of coolant around the blade does not necessarily indicate that the coolant is being properly directed. For these reasons it is most essential to have an adequate supply of coolant under sufficient pressure to overcome any envelope of air surrounding the diamond blade caused by its rotation. Great care must also be taken to put the coolant on the blade and in the kerf in a proper manner so as to assure that the cutting surfaces are kept wet at all times. There are many types of coolant application systems – some quite elaborate yet ineffective; others highly praised as ideal systems are found to be grossly inadequate under actual cutting conditions. One of the most simple systems the one used in this presentation is one that simulates a turning fork and consists to two perforated pipes extending along the sides of the blade into the center and connected to common pipe at the outer end and fastened to the blade guard. The flow of coolant is directed downward at approximately at 30 degree angle to the rotating blade. With the flow applied in this manner, jets of coolant will penetrate the air envelopes surrounding the rotating blade and cling to the surface of the diamond blade instead of bouncing off. The coolant will then spiral to the periphery of the blade in a thin wheel, wetting the cutting surface and reaching the bottom of the kerf. As in case of fed rate, depth of cut has a very pronounced affect on blade life and cutting performance. In cutting the softer materials such as stone and the more open structured, loosely bonded materials, the full depot of cut can be made in one pass. In the harder, denser materials such as most granites, fine grained alundum, it is necessary to use step cut procedure. If too great depth of cut is taken, the diamond blade will become glazed and dull with poor performance. It is therefore necessary to establish and maintain a definite dept of cut depending on the application and the material being cut. cut wheel. This is true whether the operation is manual or automatic. Some operators can make almost any diamond blade perform to maximum efficiency, while other do not have this feel, ability, or experience. It is therefore necessary in any comparative test to use the results from one/same operator. For best performance of diamond blade a constant peripheral speed should be maintained through the cutting period. Since one of the factors affecting the life of the blade is the wheel speed – SFPM – any fluctuations during the cutting period and tests must be eliminated or reduced to a minimum. Sufficient power must be supplied to the driving shaft to assure a constant RPM. Now that some of the fundamental requirements for a sound testing program have been briefly analyzed, we can set up some realistic testing procedures. Taking the operating conditions and requirements discussed into account, a simple yet informative procedure can be established for use either in the laboratory or in the field. Each material / application will require different testing procedures and methodology. Testing conditions, equipment and desired results will vary with each group. Before setting up the group procedure, one piece of equipment common to al will be described. It is not always practical to completely wear out the blade to obtain the desired data. In those instances where we wish to obtain results without testing a blade to destruction, we use the technique of measuring the wear on the blades at specific intervals and projecting this information to give a theoretical blade life. It is assumed that the rate of wear will be reasonable uniform through the usable diamond depth. To verify the results, total life tests must frequently be made. To measure the wear on blade all that is needed is to obtain a difference between the initial diameter and the diameter after the blade is used. For this we can use a vernier caliper, tubular micrometer or similar measuring devices. What you should know before you buy your next diamond blade? © Copyright 2002-2008. UKAM Industrial Superhard Tools. No portion of this web page or its design, images, logos, may be reproduced in any form without written permission from UKAM Industrial Superhard Tools.